Blu-ray discs undoubtedly offer high-quality video content with cinematic and amazing experience, but all players and devices do not support playing the Blu-ray format. Though HDTV supports Blu-ray discs, if you try using DVD or other media players, you will fail. So to make your Blu-ray discs compatible with the majority of the players, you need to convert Blu-ray to DVD using software like Wondershare UniConverter (originally Wondershare Video Converter Ultimate), DVDFab Blu-ray to DVD converter, and others. Besides compatibility, transferring Blu-ray to DVD makes it easy to edit the videos using software like Final Cut Pro X and others. For budget-conscious users, DVD is definitely an economical way compared to Blu-ray discs for storing favorite video content. So for clearing all your queries on how to convert Blu- ray to DVD format, we are here with the best solutions. Part 2. What Is Blu-ray DVD? To help you in the process of transferring content, you would need good software. A professional Blu- ray to DVD converter is clean, fast, and safe to install and use. Wondershare UniConverter (originally Wondershare Video Converter Ultimate) is one such expert program that allows lossless quality transfer in form of DVD disc, DVD folder as well as ISO image files. 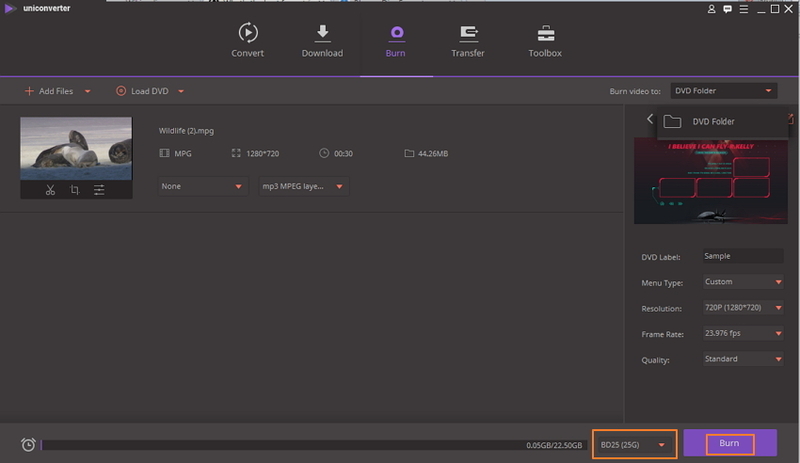 Additionally, it supports more than 1000 formats for converting your discs to the desired one. With excellent video editing tools like cropping, trimming and others, you can personalize the videos. The available DVD menu template and themes allow you to select the design as per their requirements. Wondershare DVD creating program has a user-friendly interface and support for Windows and Mac systems. The Blu- ray to DVD free download of the software is available from the site link. Step 1 Launch Wondershare Blu-ray to DVD converter and add Blu-ray file. 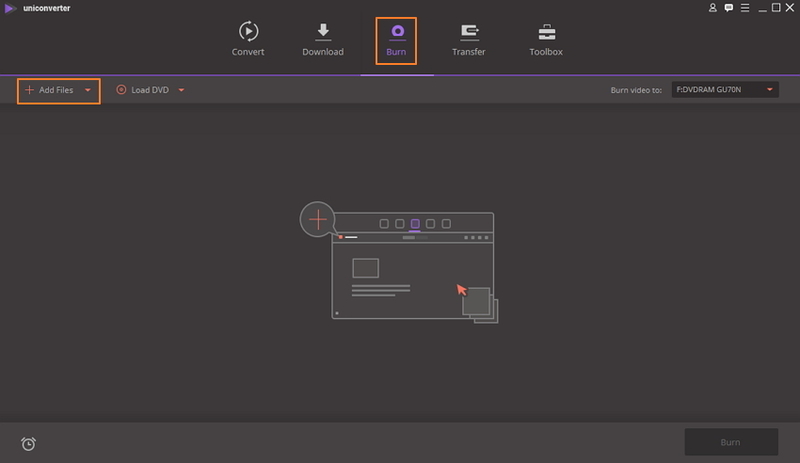 Open UniConverter (originally Wondershare Video Converter Ultimate) on your PC and select the Burn tab from the main interface. Click +Add Files to browse and add Blu-ray videos present on your system. 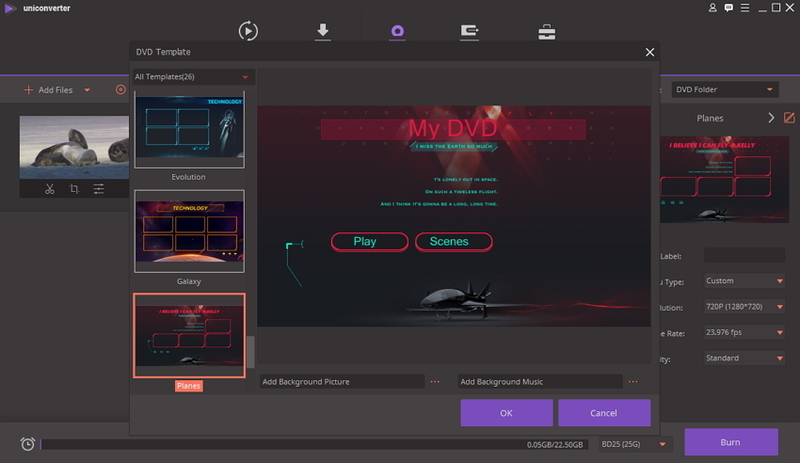 After successfully adding Blu-ray video, select the DVD template from the available options on the right-side panel of the interface. Moving the left and the right arrow helps to check the available options. To check for more designs or o add background image or music, click the Edit icon in the top-right corner. Next, enter DVD label and select DVD parameters related to menu type, aspect ratio, TV Standard, and quality. Step 4 Start burning Blu-ray video to DVD. For burning Blu-ray discs, select BD25 or BD50 from the drop down menu at the bottom-right corner. If you want to burn common DVD, select DVD9 or DVD5. Finally, hit the Burn button to start the process. Considering the fast and easy conversion, Wondershare UniConverter (originally Wondershare Video Converter Ultimate) is the best Blu- ray to DVD converter available. A Blu-ray Disc (BD) is a high definition digital optical data storage format that was introduced to the consumers in the year 2006. The format was developed in order to supersede and replace the DVD format. Though the size of a Blu-ray disc is same as that of a DVD or a CD, it offers higher storage facility with better quality, owing to the blue laser technology and sophisticated compression technology. The limitations of DVD quality become more prominent on large size HDTV and video projectors and to overcome this, Blu-ray discs are the best choice. As compared to DVD, Blu-ray is capable of offering wider color shades, more depth and better detailing of the videos. In terms of audio as well, Blu-ray offers better quality as it can hold up to 8 channels of uncompressed audio. There is a decent collection of Blu-ray movies available on Amazon, which you can purchase and enjoy. To make your search easier, we have picked up top 10 high rated movies for the year 2019. Description: Directed and written by Christopher Nolan, Dunkirk is a war film which shows the evacuation from the 3 perspectives including sea, land, and air. At the 23rd Critic’s Choice Awards, the file was nominated in 8 categories. The star cast of the film include Fionn Whitehead, Tom Glynn-Carney,James D'Arcy, Barry Keoghan, Kenneth Branagh, Cillian Murphy, Mark Rylance,Tom Hardy, Jack Lowden, Harry Styles, and Aneurin Barnard. The budget of the movie was $100 million and it was released in English language in UK, US, Netherland, and France. Description: Written by Chris Morgan and directed by F.Gary Gray, The Fate of the Furious is an American Action movie which is the 8th title in The Fast and the Furious franchise. The movie is alternatively also known as F8, Fast 8, and Fast & Furious 8. The movie was made with total of $250 million whereas it earned $1236 billion at the Box office. At its opening weekend, it grossed around $542 million worldwide and set the record for the highest –grossing opening of all time. Description: Based on 2004 documentary, The Conscientious Objector, Hacksaw Ridge is a biographical war drama which is written by Andrew Knight and Robert Schenkkan and directed by Mel Gibson. The star cast of the movie include Andrew Garfield, Sam Worthington, Luke Bracey, Teresa Palmer, Hugo Weaving, Rachel Griffiths, and Vince Vaughn. The brilliant performance of Garfield under Mel Gibson direction not only earned positive reviews. The American Film Institute chose the movie as one of the top 10 movies of the years. Many other nominations and awards were also earned by Hacksaw Ridge. Description: Written by Jonathan Nolan and Christopher Nolan, Interstellar is a movie which is set in the dystopian future where there is struggle for humanity to survive. In the movie, a group of astronauts are followed through a wormhole for searching a new home for humanity. Directed by Christopher Nolan, this science fiction movie has earned a gross of more than $675 million which makes it the 10th highest grossing movie of the year 2014. Description: Released on 7th of July, 2017, Spider-Man:Homecoming is an American superhero movie that is based on Spider-Man. The film is co-produced by Marvel Studios and Columbia Pictures and was distributed by Sony Pictures Releasing. Directed by Jon Watts, the role of Spider-Man/Peter Parker is played by Tom Holland. Other star cast include Michael Keaton, Jon Favreau, Zendaya, Donald Glover, Tyne Daly, Marisa Tomei, Robert Downey Jr. In US the movie was released in 3D, IMAX, and IMAX 3D and worldwide it grossed more than $800 million. Description: Based on the Marvel Comics superhero team Guardians of the Galaxy, it is an American superhero movie that was released on 5th May, 2017 in US. Produced by Kevin Feige and directed by James Gunn, the star cast of the film includes Chris Pratt, Bradley Cooper, Pom Klementieff, Elizabeth Debicki, Chris Sullivan, Sean Gunn,Zoe Saldana, Dave Bautista, Vin Diesel, Michael Rooker, Karen Gillan, Sylvester Stallone, and Kurt Russell. The movie is the sequel to the Guardians of the Galaxy which was released in the year 2014. The plot of the film revolves around the Guardians who travel throughout the Cosmos while helping Peter Quil to know more about his parentage which is mysterious. Released in 3D and IMAX 3D, the movie was the 7th highest grossing film of the year 2017 with amount of over $863 million. Description: Released on 2nd June, 2017 in the US and 15th May 2017 in Shanghai, Wonder Woman is an American superhero movie. Directed by Patty Jenkins, the film is based on DC Comics character of Wonder Woman. Gal Gadot plays the title role/Diana Prince in the movie and supporting star cast include Chris Pine,Danny Huston, David Thewlis, Connie Nielsen,Robin Wright,and Elena Anaya. The movie was released in 2D, 3D, and IMAX 3D and it set the various box office records. Critics also gave positive reviews to the movie for its music, performance, and direction. Description: Produced by Illumination Entertainment for Universal Pictures, Despicable Me 3 is a 3D computer animated action comedy movie. It is the 4th movies overall in the Despicable Me Series and the 3rd main. Written by Cinco Paul and Ken Daurio, direction is taken care by Pierre Coffin and Kyle Balda. The movie was premiered at the Annecy International Animated Film Festical on 14th of June 2017 and in US was released in 3D, RealD 3D, IMAX 3D, and Dolby Cinema on 30th of June, 2017. It was the 4th highest grossing movie in 2017 and grossed more than $1 billion worldwide. Description: Released on 21st September, 2017 in the US, The Lego Ninjago is a 3D computer animated martial arts comedy movie. Starring Jackie Chan, Abbi Jacobson, Dave Franco, Justin Theroux, Fred Armisen,Olivia Munn, Kumail Nanjiani, Michael Peña and Zach Woods, the film is based on Lego Ninjago toy line and is directed by Charlie Bean, Bob Logan, and Paul Fisher. There is a story within a story in the movie which lays focus on a teenage ninja when is trying to accept truth about his villainous father and there is a new threat to his homeland. It is the first theatrical movie that is based on original Lego property and the 3rd of The Lego Movie series. Description: Directed by David Yates, it is a fantasy movie and a prequel and spinoff to the Harry Potter series of the films. Produced and written by J.K Rowling, it is also a debut screenwriting attempt of the writer. The movie is inspired by the book of the same name which was written in 2001 by J.K Rowling. Starring Eddie Redmayne, Katherine Waterston, Dan Fogler, Alison Sudol, Ezra Miller, Jon Voight, Carmen Ejogo, Ron Perlman, and Colin Farrell, the movie premiered on 10th November 2016 in New York City and was released worldwide in 3D, IMAX 4K and other formats on 18th of November, 2016. So now if anyone asks you - can you copy Blu- ray to DVD? You can confidently say yes and also show them the best method for doing so by installing UniConverter (originally Wondershare Video Converter Ultimate).